With the great development of laser standard systems and high-precision laser measurement systems, demands of optical systems have resulted in a dramatic increase in performance requirements for thin film optical filters. In this letter, the analysis and manufacture of the double-layer structure of the ultra-low residual reflectance for a single wavelength are reviewed. From a manufacturing standpoint, the manufacture and analysis of these coatings, which satisfy the requirements mentioned, pose as major problems. 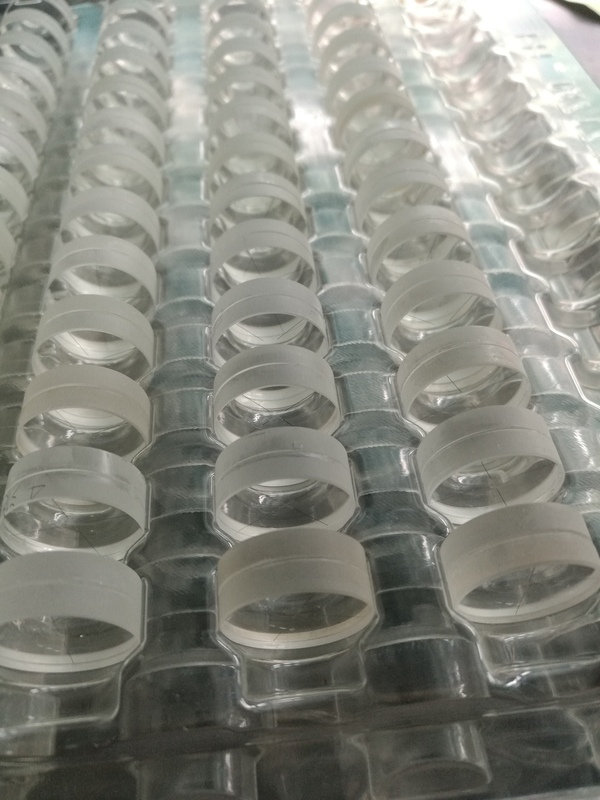 The coatings are characterized according to ellipsometry analyses and adjustment of the center wavelength of the antireflection (AR) coating Ta2O5/SiO2 double layers. AR coating is deposited on silica substrates by ion beam sputtering (IBS) technique, thus, achieving residual reflectance of less than 0.005% at λ0 = 632.8 nm. Antireflection (AR) coating on optical surfaces is a technologically important topic. It is one of the first problems solved with the aid of thin films, and it is also the subject of the first book published in 1946 devoted entirely to optical multilayer coatings. 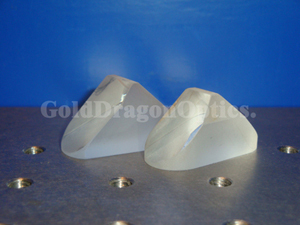 Currently, AR coatings are constructed for spectral regions that extend from ultraviolet (UV) to infrared (IR). Many different types of AR coatings are available, providing effective ways to meet most of the needs in the field of technical optics. However, the specialized requirements of sophisticated optical systems and laser optics place very stringent requirements on performance. For example, high-power laser systems demand certain elements with very low reflections in order to avoid damage to sensitive elements from unwanted reflections. In addition, in multi-element optical systems, broadband-efficient AR coatings enhance overall performance by improving image quality, color balance and control, and range, while reducing ghosting and other undesired effects. Real needs, therefore, have provided continued incentives for recent developments of special types of thin film AR coatings. Laser systems for measurement (and so on) such as a gyroscope make use of optical components in the laser cavity or path that need very high performances such as low loss, low scattering, low reflection, low absorption, and ultra-high transmittance. In this letter, Ta2O5/SiO2 double-layer AR coating on silica at the center wavelength of 632.8 nm (He-Ne laser) with ultralow residual reflection is designed and manufactured. To date, ion beam sputtering (IBS) remains one of the best deposition methods for achieving a low-loss and lowscattering coating. The detailed technical parameters of deposition are shown in Table 1. Here, radio frequency (RF) 16-cm ion source from Ion Tech Corp. is utilized.Ta2O5 and SiO2 are chosen as the high (H) and low (L) refractive index coating materials, respectively. Purities of the two targets consist of Ta and SiO2 greater than 99.99%, with diameters of 360 mm, which are larger than that of the ion beam, to ensure that the fixture would not be sputtered and contaminate the system. 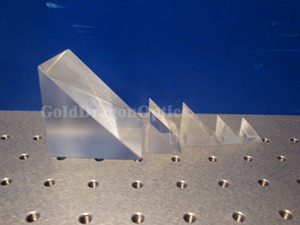 Double-layer coatings are adequate for many laser optics applications. 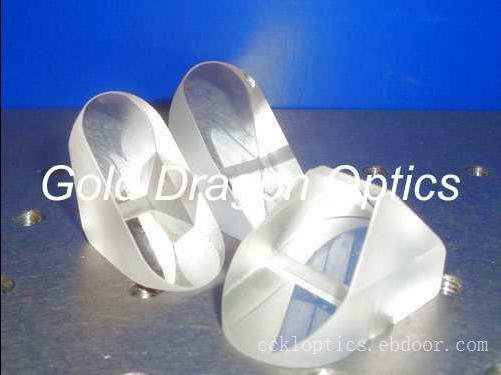 The lowest reflectance that can be obtained with double-layer AR coatings for single wavelength on arbitrary refractive-index substrate material is adequate as well. In this letter, the refractive index of the silica substrate is shown in Fig. 1. The all-spectra fitting method[5,6] is used to determine the optical constants and the physical thicknesses of Ta2O5 and SiO2 single-layer films. All spectral scans of transmittance and reflectance of the single-layer films are analyzed based on the nonlinear least square method. These scans were made on a Lambda-900 dual beam spectrophotometer covering the visible, near-UV, and near-IR wavelength ranges. Optical constants of the Ta2O5 and SiO2 films are shown in Figs. 2 and 3, and deposition rates are 0.1 and 0.08 nm/s, respectively. Double-layer film materials have weak inhomogeneity ?n along the film thickness, this value is ?nTa2O5 = 2.30382% and ?nSiO2 = 1.72761%, as shown in Fig. 4. Thus, the central wavelength is 632.8 nm, and the angle of incidence is 0? . Inhomogeneous influence of the thin film on the residual reflectance of AR coating was calculated. The calculated residual reflectances of ideal design and AR with inhomogeneity are shown in Fig. 5, respectively. In order to obtain AR with inhomogeneity, AR coating is designed and optimized on the basis of simulated annealing algorithm, which is calculated by Matlab. Figure 6 shows the designed result with inhomogeneity and the ideal designed result. The optical descriptions of the two designs are given in Table 2. From Table 2, we can see that the discrepancies of thin film thickness of the two designs for H and L layers are 3.7% and 8.8%, respectively. This means that the accuracy of time monitoring is less than 3.7% and 8.8% for the same deposition rate; otherwise, the change of residual reflectance, which is greater than 0.002%, can be realized. We used J. A. Woollam spectroscopic ellipsometry and Lambda-900 dual beam spectrophotometer to the adjustment of the central wavelength of the AR coating spectrum. Spectroscopic ellipsometry measurements were made with a two-channel spectroscopic polarization modulation ellipsometer from 300 to 900 nm at the angle of incidence equal to 55? and 65? , respectively. In order to obtain the discrepancy of double-layer thin film of design and experiment, ellipsometric parameters phase-shifting ? and phase Ψ and spectroscopic transmittance were measured, thus, determining the discrepancy of thickness of the H and L layers thin film after deposition. The differences between design and deposition are shown in Fig. 7. From Fig. 7, it can be seen that the central wavelength of AR coating is adjusted to the long wavelength (λ0 > 632.8 nm). Both the ellipsometric data and the transmittance spectrum data together are chosen as optimum targets to calculate the differences of ideal design and design with inhomogeneity. The calculated results show that differences of the H and L layers are 1.3549% and 5.1574%, respectively. Thus, we must adjust deposition time of the double-layer thin film for primary deposition time 1.3549% and 5.1574%. Experimental results are shown in Fig. 8, and the uniform measurement data agree with designed data. The residual reflectance of the AR coating at wavelength (λ0= 632.8 nm) is less than 0.005% by the testing instrument of residual reflectance. 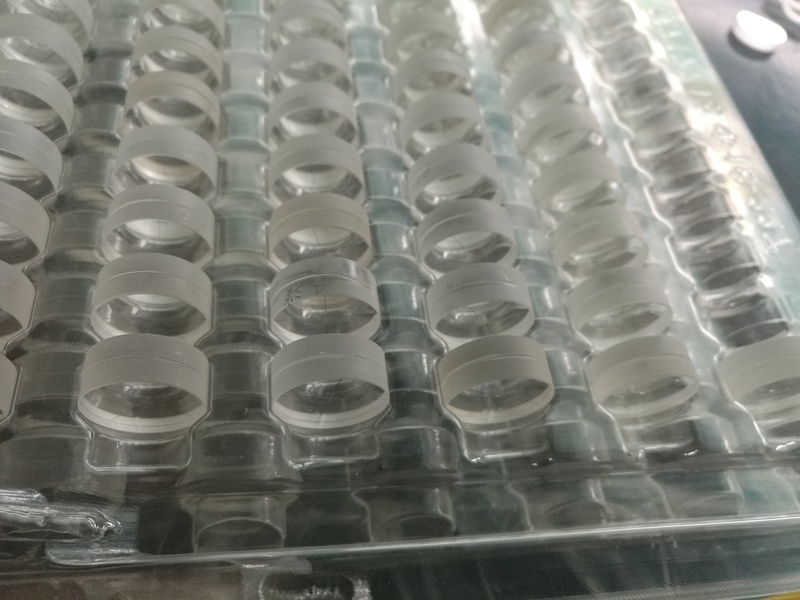 In conclusion, if the residual reflectance is less than 0.005%, the influence of inhomogeneity on the thin film of AR coating must be considered and the high accuracy of control layer thickness for deposition system is required. In this paper, we choose the Ta2O5 and SiO2 as H and L refractive index coating materials, respectively, use simulated annealing algorithm to design AR coating with inhomogeneity, adjust the central wavelength based on spectrophotometer and spectroscopic ellipsometry, and fabricate the coatings by IBS deposition system with the time-power monitoring of thickness. Thus, the results show that the ultra-low residual reflectance of AR coating is less than 0.005%.